Two competitor leagues to the NFL called the American Football League had already come and gone when a third circuit of that name held an organizational meeting on July 13, 1940. The third AFL had actually taken the field in 1938 as the renamed Midwest Football League and by 1939 had eight teams, including the Cincinnati Bengals and Los Angeles Bulldogs franchises that had existed in the second American Football League. But this new AFL had been considered a minor league centered in the Midwest, along with the Bulldogs (who moved on to the Pacific Coast Football League). On the eve of the meeting to plan the 1940 season, representatives of Boston, Buffalo, and New York City announced the formation of a new AFL that included the Cincinnati, Columbus, and Milwaukee clubs from the ’39 entity. St. Louis and Kenosha were denied entry, although the Kenosha Cardinals were allowed to play a slate of exhibition games and existed as an independent club afterward. The next month William D. Griffith, former publicity director at Ohio State, was named league president and a schedule was released. During a time period when there were other minor league circuits of good quality, the Pacific Coast Football League and the American Football Association, the 1940 AFL at least presented itself as a major league in competition with the NFL. Two holdover clubs from the previous season proved to be the strongest in the reconstituted AFL. The Milwaukee Chiefs got off to a 3-0 start and battled with the Columbus Bullies for the top spot. The Chiefs had an outstanding runner in FB Al Novakofski and league All-Stars in end Sherman Barnes and tackle Bob Eckl, who also led the circuit with five field goals. Columbus had the league’s scoring leader in HB Nelson Peterson. The Bullies also had All-Stars in guard Jim Karcher and center Joe Aleskus. They managed to stay even with the Chiefs after dropping their opening game and, when Milwaukee lost two straight, moved into first place and never relinquished it. Columbus won the AFL title with an 8-1-1 record and the Chiefs placed second at 7-2. The Boston Bears were the only other club to put together a winning record, at 5-4-1, and had the AFL’s All-Star quarterback in Andy Karpus. The New York Yankees, Buffalo Indians, and Cincinnati Bengals rounded out the standings at 4-5, 2-8, and 1-7 respectively. 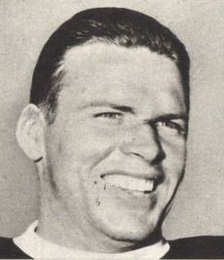 The Yankees had the league’s second-ranked scorer in HB Bill Hutchinson and end Harlan Gustafson tied with Novakofski for the most touchdowns with six. The Indians managed to score only 45 points and Cincinnati was barely better with 53. All in all it had been an encouraging season for the AFL, even if it was not very successful at prying talent away from the NFL and was not qualitatively much better than the avowedly minor league circuit of 1939. Looking to 1941, the league announced that it would hold a special draft aimed at corralling the 50 top college stars, with the inducement of giving the prospects the opportunity to play with the team of their choice. The gambit failed, as did talk of expanding. Thus, the league was actually down to five teams for the ’41 season with Boston dropping out just prior to the opening game. New York provided notoriety when, under new ownership, it went after Texas A & M All-American fullback John Kimbrough (pictured at top). The club eventually signed him, but there were further problems when the league forced a change in the team ownership. 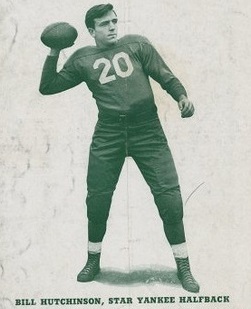 Now called the Americans, New York was able to finally get Kimbrough on the field in mid-October, along with Michigan’s Heisman Trophy-winning HB Tom Harmon. It was a publicity bonanza and 25,000 fans attended their debut performance against Columbus at Yankee Stadium. Harmon went into the service following his single appearance, although Kimbrough played well the rest of the way and achieved All-League honors. The Americans topped the AFL in attendance but not in the standings as they finished at 5-2-1 and second to the Bullies, who repeated as league champs with a 5-1-2 tally, benefiting from the outstanding play of QB Bob Davis. Milwaukee went 4-3-1 while Buffalo and Cincinnati again claimed the bottom two slots at 2-6 and 1-5-2. With the attack on Pearl Harbor bringing the country into World War II, the league ultimately decided to suspend operations for the duration of the conflict and never returned. It quickly faded into history, and there has long been debate as to whether this version of the AFL was truly the major league that it claimed to be. The All-America Football Conference that came into being in 1946 was a far more significant rival to the NFL and it would remain until the 1960s for a circuit called the American Football League to have staying power.